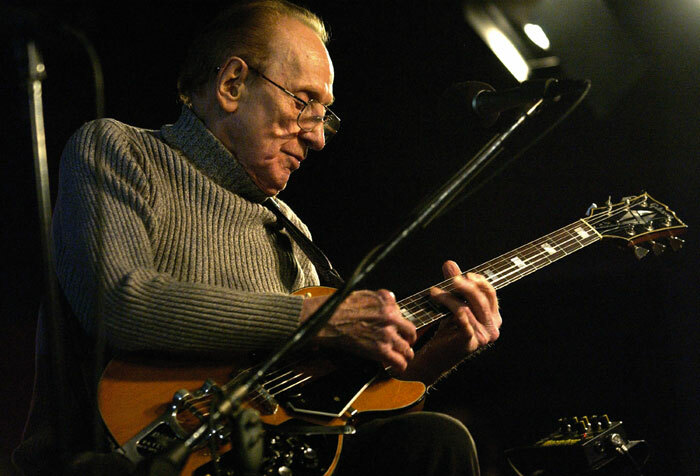 Lester William Polsfuss (June 9, 1915 – August 12, 2009) known as Les Paul—was an American jazz, country and blues guitarist, songwriter and inventor. He was the inventor of the solid-body electric guitar which made the sound of rock and roll possible. He is credited with many recording innovations. 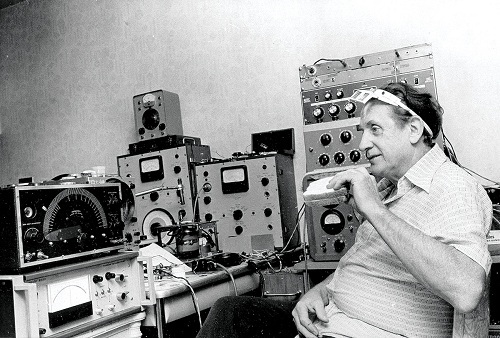 Although he was not the first to use the technique, his early experiments with overdubbing (also known as sound on sound), delay effects such as tape delay, phasing effects and multitrack recording were among the first to attract widespread attention. His innovative talents extended into his playing style, including licks, trills, chording sequences, fretting techniques and timing, which set him apart from his contemporaries and inspired many guitarists of the present day. He recorded with his wife Mary Ford in the 1950s, and they sold millions of records. Among his many honors, Paul is one of a handful of artists with a permanent, stand-alone exhibit in the Rock and Roll Hall of Fame. He is prominently named by the music museum on its website as an "architect" and a "key inductee" along with Sam Phillips and Alan Freed. Paul had never been happy with the way his records sounded. During a post-recording session talk with Bing Crosby, the crooner suggested Paul try building his own recording studio so he might be able to get the sound he wanted. At first Paul discounted the idea only to give it a few more minutes thought before deciding Crosby was right. Paul started his own studio in the garage of his home on Hollywood's North Curson Street. The studio drew many other famous vocalists and musicians who wanted the benefit of Paul's expertise. The home and studio are still standing, but both had been moved to Pasadena at some point after Paul no longer owned the home. 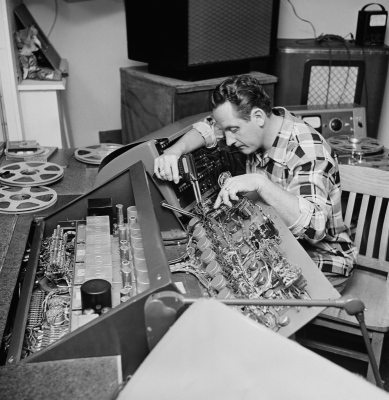 In 1948, Les Paul was given one of the first Ampex Model 200A reel-to-reel audio tape recording decks by Crosby and went on to use Ampex's eight track "Sel-Sync" machines for Multitrack recording. Capitol Records released a recording that had begun as an experiment in Paul's garage, entitled "Lover (When You're Near Me)", which featured Paul playing eight different parts on electric guitar, some of them recorded at half-speed, hence "double-fast" when played back at normal speed for the master. ("Brazil", similarly recorded, was the B-side.) 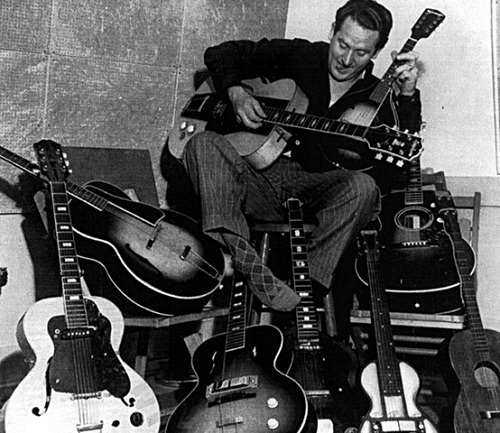 This was the first time that Les Paul used multitracking in a recording (Paul had been shopping his multitracking technique, unsuccessfully, since the '30s. Much to his dismay, Sidney Bechet used it in 1941 to play half a dozen instruments on "Sheik of Araby"). These recordings were made not with magnetic tape, but with acetate discs. Paul would record a track onto a disk, then record himself playing another part with the first. He built the multitrack recording with overlaid tracks, rather than parallel ones as he did later. By the time he had a result he was satisfied with, he had discarded some five hundred recording disks. Electronics engineer Jack Mullin had been assigned to a U.S. Army Signal Corps unit stationed in France during World War II. On a mission in Germany near the end of the war, he acquired and later shipped home a German Magnetophon (tape recorder) and fifty reels of I.G. Farben plastic recording tape. 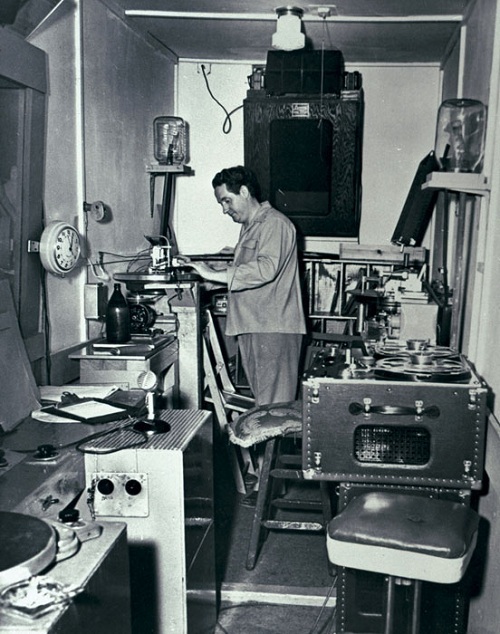 Back in the U.S., Mullin rebuilt and developed the machine with the intention of selling it to the film industry, and held a series of demonstrations which quickly became the talk of the American audio industry. Within a short time, Crosby had hired Mullin to record and produce his radio shows and master his studio recordings on tape. Crosby invested US$50,000 in a Northern California electronics firm, Ampex. With Crosby's backing, Mullin and Ampex created the Ampex Model 200, the world's first commercially produced reel-to-reel audio tape recorder. Crosby gave Les Paul the second Model 200 to be produced. 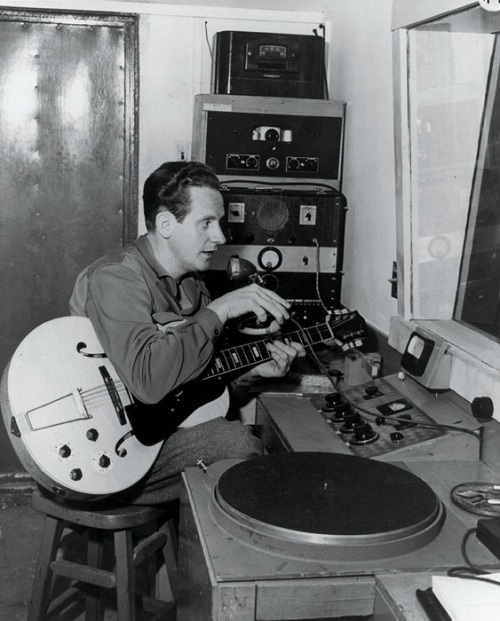 Les Paul invented Sound on Sound recording using this machine by placing an additional playback head, located before the conventional erase/record/playback heads. This allowed Paul to play along with a previously recorded track, both of which were mixed together on to a new track. This was a mono tape recorder with just one track across the entire width of quarter-inch tape; thus, the recording was "destructive" in the sense that the original recording was permanently replaced with the new, mixed recording. He eventually enhanced this by using one tape machine to play back the original recording and a second to record the combined track. This preserved the original recording. 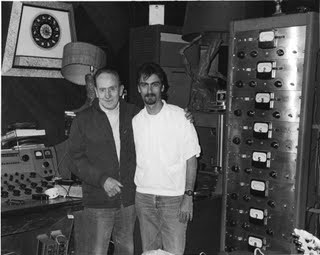 Les Paul bought the first Ampex 8-track recorder in 1957. Rein Narma built a custom 8-channel mixing console for Les Paul. The mixing board included in-line equalization and vibrato effects The recorder was named "the octopus" and the mixing console was named "the monster". The name octopus was inspired by W. C. Fields who was the first person Les Paul played a multi-track recording to. Upon hearing the recording W. C. Fields said: 'My boy, you sound like an octopus. Do you have content or pictures, to add, of Les Paul? Do you just want to say "Hello!"? Please feel free to Share it, here! 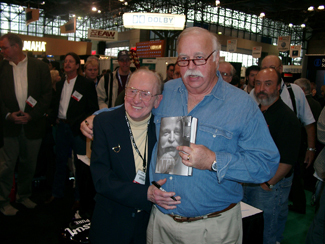 What other Visitors have said about Les Paul!